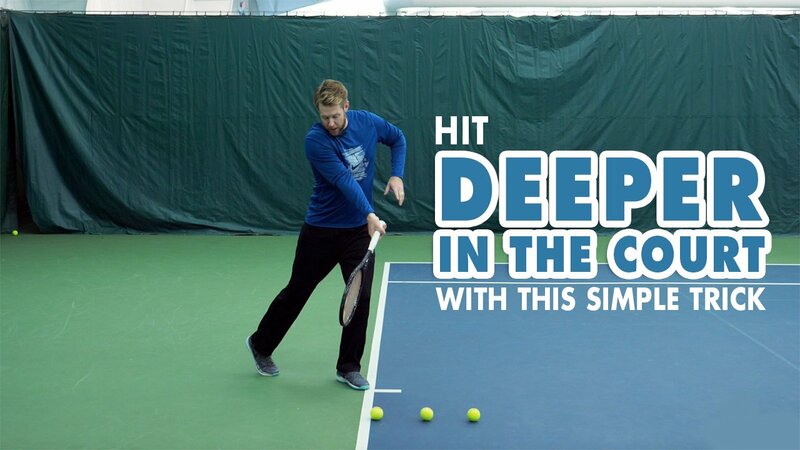 Today we show you a simple trick to improve your groundstroke depth. This video is for players with a PlayYourCourt rating of 79 and below. 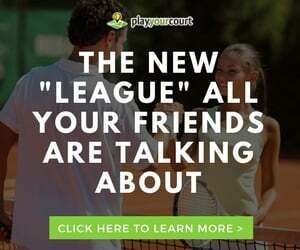 – Hey guys, Scott Baxter from playyourcourt.com here. Today I’m gonna show you a simple trick to hit the ball deeper in the court. Hey guys, so today we’re talking about groundstroke depth, this video just to be clear, is for players with a PlayYourCourt rating of 79 and below. 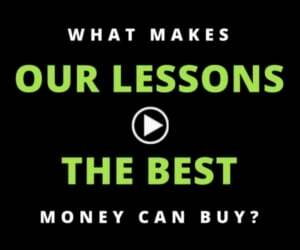 If you’re not in our community or familiar with our rating system, a 79 is the equivalent of a USTA 4.0, so if you’re a 79 PlayYourCourt or 4.0 USTA or below, this video is for you. So let’s dive right in here, we’re talking about groundstroke depth, and I think a lot of players have received coaching and they hear things like, “extend out and follow through” for groundstroke depth. And for me, I always like something visual that really drives home this point. I know a lot of the players I coach just don’t really understand, you know they get they’re supposed to extend through the ball, but they don’t have necessarily a visual idea of what this looks like. So, when you zoom out here what you can see is I’ve set three balls up on the court here and I want you to envision these balls when you look from the side angle, on a staircase. So this back ball would be on the ground, or you know maybe a little bit closer to the bottom of the staircase, maybe around knee-height. The second ball on the next stair, the third ball on the next stair up, so your staircase is moving up in this direction. What I want you to think about when you make contact with the ball, is that I want you to pretend like you’re extending through three balls up a staircase before that wrist breaks the contact. The mistake that we see as coaches, more times than not, players making contact with that front ball and then they’re breaking their wrist. And while their ball is getting over the net, it’s only landing in at maybe around the service line or just past the service line. So if you want those extra couple feet of depth, where you’re really pushing the ball more towards the baseline, what we wanna see as coaches is after you make contact with that ball in front of your hip, we wanna see you extend out and up through two more balls before that wrist breaks over your shoulder to follow through. I know this is simple, but it just gives you a visual depiction of what we as coaches actually want you doing when you’re extending through the ball to ensure you’re getting the depth that you’re looking for. I hope this helps. In summary, think about three balls on a staircase moving up and out before you break that wrist to follow through. As you guys know here at PlayYourCourt we’re super passionate about helping you improve your tennis game, but the problem is, we don’t know anything about your specific game or skill level, so do me a favor, click the button below and answer a couple of quick questions for me about your game and I’ll send you some custom coaching based on the things that you need to be working at your particular skill level. Just click the button below and we’ll do the rest.